It's still winter, it's still cold and there is even more snow forecast. On top of that, it is February, credit card bills from Christmas are overdue and there still isn't enough sun or daylight to keep everyone in good cheer. At this time of year I find myself turning to slow-cooked stews, vegetable soups and casseroles for the family. Last week, I spotted oxtail on the butchers counter and bought a few pieces to try it on the family. The teen grew into a phase of really fussy eating between about 5 and 13, she has slowly eased out of it trying first mussels, then meat with bones in (that was a big one!) but I am yet to persuade her of the flavour and enjoyment to be found in offal and other trimming cuts. But she does love beef, so since it is less than a pace from a rump steak to the tail, I thought I would risk the minimal cost and make an oxtail stew. 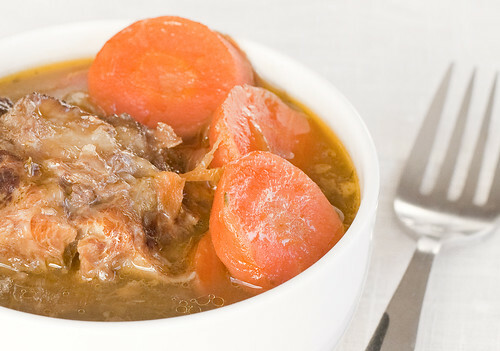 This is a very easy and lazy recipe making best use of a slow cooker or aga to gently heat the stew for hours at a time. Early one morning this week, whilst waiting my eyes to focus in the grey dawn and the coffee to brew, I roughly chopped up some celery, carrots & onions and slowly fried them off in a touch of olive oil with a clove or 2 of garlic added. This was piled into the slow cooker with herbs, a few pieces of oxtail, some left over red wine and beef stock. And that was it, slow cooking for 10 hours to create a rich and unctous stew with delicious gravy. Serve with good crusty bread or mashed potato, a touch of mustard and a glass of red wine or proper beer. to serve, remove herbs, serve with a green salad and crusty bread or mashed potatoes and mustard. Oh I love slow food and a glass of red wine sounds just the thing. I have always wanted to find something to tempt my other half to try oxtail as she has never liked offal or other cuts of meat than the 'usual' ones. I would love to use this to try - what was the reaction to it in your household?